Notes the Habsburg hereditary lands south of the Semmering Pass. l'Archiduche d'Autriche et les Duches de Stirie, Carinthie et Carniole. This is a nice 1748 map of Inner Austria or the duchies of Styria, Carinthia and Carniola by Robert de Vaugondy. Covers parts of modern day Austria, Hungary and Slovenia and extends from Passau in Germany south to the Gulf of Vienna and from Salzburg east to Venice and Lake Balaton in Hungary. The entire region is depicted in extraordinary detailed, offering both topographical and political information, with forests and mountains beautifully rendered in profile. The region, was known as Inner Austria from the 14th to 17th centuries referring to the Imperial duchies and the Habsburg hereditary lands south of the Semmering Pass. 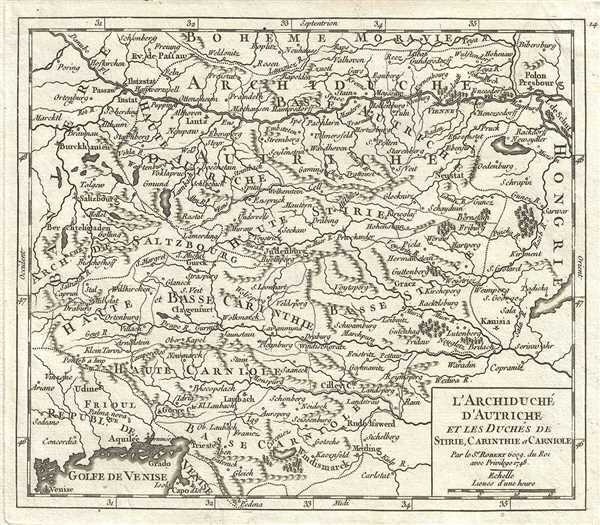 This map was published in the 1748 edition of Vaugondy's Atlas Portratif Universel et Militaire. Vaugondy, R., , (Paris) 1748. Pedley, M. S., Bel et Utile, p. 179, 275.